AWS Amazon boasts that it has “hundreds of thousands of customers in more than 190 countries.” They have a client list that includes some of the world’s most well known company’s: Netflix, Expedia, Newsweek, Airbnb and Hess, to name a few. Amazon’s AWS hosting caters mainly to clients that require hard disk space as opposed to having their full websites running on the Amazon servers. So, to the regular user, the message could read: unless you are running a static website with simple processes, you won’t be able to host a site with Amazon. Nevertheless, clients could make use of AWS Amazon’s CloudFront, a content delivery web service that integrates with Amazon and allows developers and businesses to project their content. Amazon’s hosting is pretty straight-forward, so a hired webmaster for a business or cooperation would most likely have no trouble understanding how it all works. That being said, a little server administration knowledge is required when managing Amazon’s databases. As Amazon is more of a database hosting company, the amount of disk space that is provided depends entirely on the amount that the client needs and is willing to pay for. 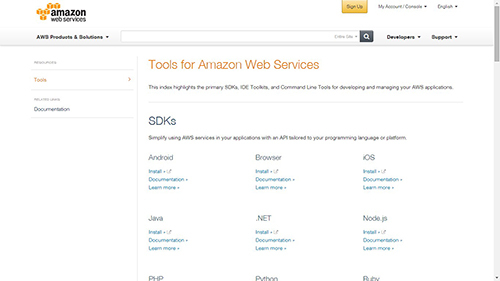 Amazon also offers a catalog of front-end applications, which users can browse for an exhaustive list of plug-ins that are ready to be added on. For ecommerce sites that need a database, applications can be used to interface with Amazon’s hosting service. But again, although the use of the applications is free, there is an added fee for usage. Depending on perspective, this could be a good thing: you only pay for the data access, not the applications. Amazon guarantees some of the best support that can be found on the internet. This includes the usual option to ask for support by raising a ticket, but support staff can also be contacted via email, phone, chat and by browsing through Amazon’s forum. Amazon’s pricing depends on the amount of data that is stored on its server and the amount of bandwidth that is used to access that data. The company’s website clearly states the prices starting from $0.120 / Month for the first 10TB and increases as the amount of data usage increases or exceeds the month’s quota. The good thing about Amazon’s pricing scheme is that clients are only charged for the data and bandwidth that they use and nothing more. But then again, the bad thing is that the client will need to keep monitoring the usage to ensure no limits are surpassed.